More than 100 working dogs employed by the federal government across the United States have been infected with the parasite Trypanosoma cruzi, the cause of Chagas disease, which may lead to heart problems, according to a new study presented today at the American Society for Tropical Medicine and Hygiene (ASTMH) Annual Meeting. Chagas disease is a tropical infection spread by a blood-sucking triatomine or "kissing bug" that may pose a growing threat in the United States. Once known only in Mexico, Central America and South America, Chagas is now making tentative incursions into the United States, infecting canines and humans. But the extent of the risk, for either, is not clearly defined. "We were surprised to find that so many dogs, including those working outside of the kissing bug range, had been exposed to the parasite T. cruzi, and were exhibiting heart abnormalities associated with the disease," said Alyssa Meyers, a Ph.D. candidate at Texas A&M University who presented the findings. The T. cruzi parasite is transmitted through the feces of kissing bugs, so called due to their tendency to feed around the mouth. Infections in humans or dogs initially can produce a fever and fatigue. But even infections that produce no symptoms can lead to an enlarged heart or abnormal heart rhythms that can cause sudden death. Meyers said that because kissing bugs can thrive in locations with high concentrations of hosts, like dog kennels, dogs in training facilities could be at risk for exposure. These dogs train at facilities in Texas and Virginia, two states with known populations of kissing bugs that carry the Chagas parasite, and it is likely that some dogs were exposed while training in the South. "From previous studies we knew that shelter and stray dogs were at risk for exposure, likely because of their time spent outdoors, and perhaps the dogs working along the U.S.-Mexico border who spend long hours outside often at night might be equally exposed," she said. "We were not expecting infection in dogs that spend most of their time working along the border with Canada or in airports in Nebraska." Meyers and fellow researchers at Texas A&M University worked with colleagues from the U.S. Department of Homeland Security (DHS) to collect and test blood samples from 1,660 working dogs in 43 states whose duties include border patrol, search and rescue, detecting drugs and explosives, and assisting officers who guard federal buildings. The testing—which was prompted by evidence of Chagas in dogs working on the Mexican border—revealed that 121 dogs, or more than 7 percent tested, had antibodies to T. cruzi, indicating an ongoing infection. Many of the infected dogs also showed signs of heart abnormalities associated with Chagas that can be fatal. Meyers said that in South America, dogs have served as effective sentinels to provide early warning of Chagas risk to humans, though dogs themselves pose little direct risk of infecting humans. But Meyers added that uncertainty about where the infected dogs picked up the parasite—including dogs now working in states within the kissing bug range—makes it difficult to say what the findings mean for human risks. Most human cases diagnosed in the U.S. are believed to have been caused by infections picked up in Latin America. But there have been documented cases of locally acquired infections in some of the southern states—Arizona, Arkansas, Louisiana, Mississippi, Tennessee and Texas. In some states this has prompted regular surveillance. Kissing bugs are now found in 27 states and as far north as Delaware. And a growing number of those bugs are known to be carrying the Chagas parasite. Meyers said the discovery of a relatively high rate of Chagas infections in working dogs is not necessarily an indication of an increasing threat to people. "A positive dog usually signals that infected kissing bugs are in the environment," Meyers noted. "But the risk to humans is likely not equal to dogs, in part because dogs have a tendency to eat bugs that could be infected with the parasite and dogs spend more time outdoors." Also, unlike the kissing bugs that transmit Chagas in Mexico and Central America, studies show the varieties found in the U.S. are less likely to infest houses, significantly reducing encounters with humans. Meanwhile, there is concern about how the disease may affect working dogs exposed to the disease, given the many important functions they provide. For example, in 2009, several military working dogs serving alongside U.S. troops conducting bomb detection work in Iraq had to be evacuated due to heart problems linked to Chagas infections, leaving troops without an important member of their team. "Not all dogs that are exposed to the parasite develop cardiac disease. Many can live a happy, healthy life," Meyers said. "We are trying to understand why some dogs remain asymptomatic, while others develop Chagas cardiomyopathy. These dogs play a critical role in our country's security, and we want to make sure we are doing everything we can do to keep them healthy." 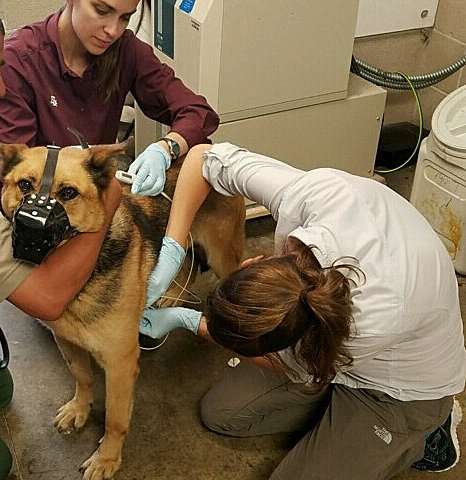 To learn more about the effect of Chagas on the DHS dogs, a subset of the infected dogs were outfitted with wearable electrocardiogram or ECG monitors that allowed researchers to obtain 24 hours of data on cardiac performance. "We just pulled the dogs aside for a few minutes to put on the monitors and then they went right back to work," Meyers said. The monitors revealed that over two-thirds of the infected dogs were showing early signs of cardiac problems associated with Chagas. The dogs are now being monitored for any signs of progression of cardiac problems. But there are no treatments available specifically for dogs infected with Chagas disease, and the researchers said that medications used to protect dogs from fleas and ticks are not known to repel either kissing bugs or the Chagas parasite. There are drugs available to treat human infections, but their efficacy varies and is especially low for infections that have been lingering for a long period undetected. A follow-up study is planned to explore interventions that can help the DHS dogs avoid exposure to kissing bugs. The researchers also are collecting additional cardiac data from the dogs in an effort to better determine whether the abnormalities detected pose an immediate risk. "This silent killer Chagas has posed a real risk to humans in certain parts of the country," said ASTMH President Regina Rabinovich, MD. "Ongoing support for research to track where this disease is and how it got there is crucial, as is enhanced education and training for those in the health sector to better recognize this disease."